These two mountains, which guard the easterly edge of the peninsular, offer a tantalising glimpse of what lies beyond. During the intervening years I have probably added in a few wisps of cloud to the image, and deepened the hue of the colours. But the sensation was clear: I knew I had to return and explore the land beyond those hills. Each New Year was marked by a resolution to head to Knoydart, and each year something else – often a trip elsewhere in Scotland – took place instead. But this year, shortly after learning that I would become a father for the first time, I made good on my promise to myself and booked a ticket to Glenfinnan. As the train chuntered north, however, a small, nagging doubt crept into my mind: what if it wasn’t as good as I expected? What if beyond those two peaks it was all a bit ordinary? What if the many rapturous descriptions of Knoydart ­– almost always along the lines of “a walker’s paradise” and “Britain’s last wilderness” – had overexaggerated? After an overnight camp outside the Tourist Information centre at Glenfinnan, I set off along the familiar path past the famous viaduct. I stopped for an early cup of tea at Corryhully bothy, partly to revisit my overnight stopover from the Streap trip, but also to check the bothy book for reports from other walkers. The Scottish hills were still thick with snow and I was anxious to learn whether the high passes on my planned route were blocked. Fortunately, the news was good; all clear through to Inverie. I made swift progress up the glen and was soon scrabbling down Gleann Cuirnean. Crossing the River Pean and entering the forests felt like an important boundary. Glenfinnan was now a long way behind me. 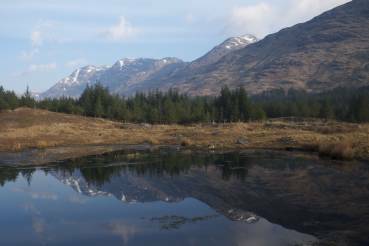 I was finally in Knoydart – Britain’s last wilderness. Except, as it turns out, Knoydart isn’t a wilderness at all. The track I was following was built for heavy-duty forestry vehicles. The trees they carry out are planted conifers, not ancient woodland. 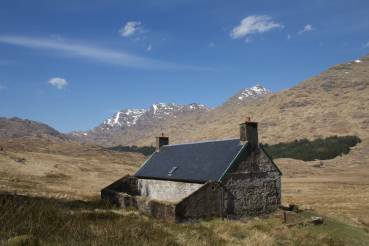 And my target for the first night was A Chûil bothy, a former cottage for a shepherd or landsman, and further evidence that this region has a long history of inhabitation. 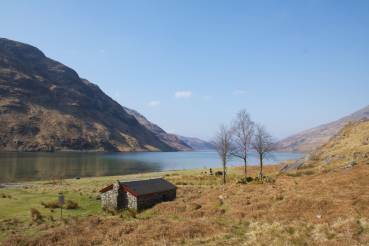 I think that some writers have misrepresented what Knoydart is. It is not a wilderness, except when compared to the rest of Britain; it is, however, remote. As I settled in for the night at the bothy, I realised how far I was from anyone. 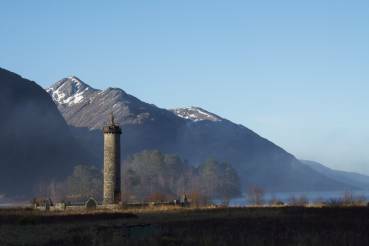 Glenfinnan was seven hours’ walk away, across two valleys. Inverie, the only major settlement on the peninsula, was at least a day in the other direction. I hadn’t seen another soul all day, nor did I expect anyone to join me in the bothy. If those deer gathering outside had menace on their minds, no one was coming to save me. So, Knoydart is not a wilderness. But the following morning, however, it more than lived up to the other oft-awarded description as an unsurpassed destination for walkers. As I walked northwest through the woodland in Glen Dessary, birdsong filled a crisp morning air that was richly scented by the pines. On the mountains above the treeline, crystal-clear water hurtled down from the last patches of winter snow, cutting deep gouges into the hills. Some of this water ends up in the lochans between Druim nan Uadhag and Meall na Sroine, which I reached via the short, sharp climb out the glen. Considerably more must seep into the surrounding bogs, which are sopping enough to test even the hardiest of footwear. My new “fully waterproof – guaranteed!” boots lasted nearly two hours of being totally submerged before caving in; a decent effort in the circumstances. 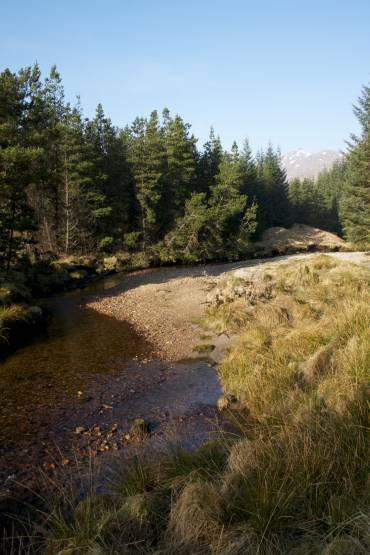 The rough path switched left and right around the lochans, following the line of the stream that connects them before meeting the Finiskaig River. This runs on to Loch Nevis, on the shore of which sits Sourlies bothy, one of the most popular honeypots for those visiting Knoydart. Two German hikers stirred in their tents as I arrived, checking to see who had disturbed their late-morning slumbers. Several flattened patches of grass suggested that there had been many other campers overnight, and the piles of empty mussel shells, harvested from the loch, were evidence of what they had eaten. While the incredible scenery is a large part of Sourlies’ appeal, its proximity to Inverie, Knoydart’s largest settlement, is another. The village was beyond the next mountain pass, little more than three hours’ walk away. It all felt a bit abrupt. Not long after I had got into Knoydart, I was already heading out and I didn’t want to leave so quickly. I moved away from the tents and the bothy to find a secluded loch-side spot for lunch, a place to cherish these last moments in the legendary Knoydart. It may not be a wilderness, but it is – without any shadow of a doubt – a walkers’ paradise.